Got out 3 days this past weekend Aug 14-16. Friday found Bedford and I back in Shinnecock, NY and a 2nd try in one week at diving the COIMBRA on the SIDEKICK after the original Montauk plans fell through. Seas were pretty flat and we’d knew we’d make it this time, we just didn’t know the conditions would be just as good underwater. Capt Chuck and Andy had us tied in and the old mooring that had sunk refloated within minutes of arriving on site. 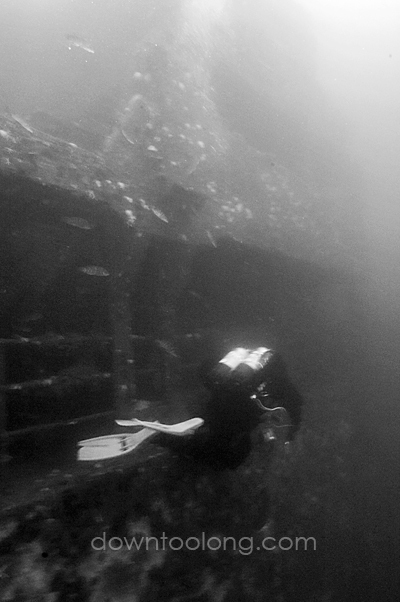 Arriving on top of the stern section of the wreck where it is broken at about 140 feet I took a minute to take in the awesome view of the big broken tanker lying on it’s side. 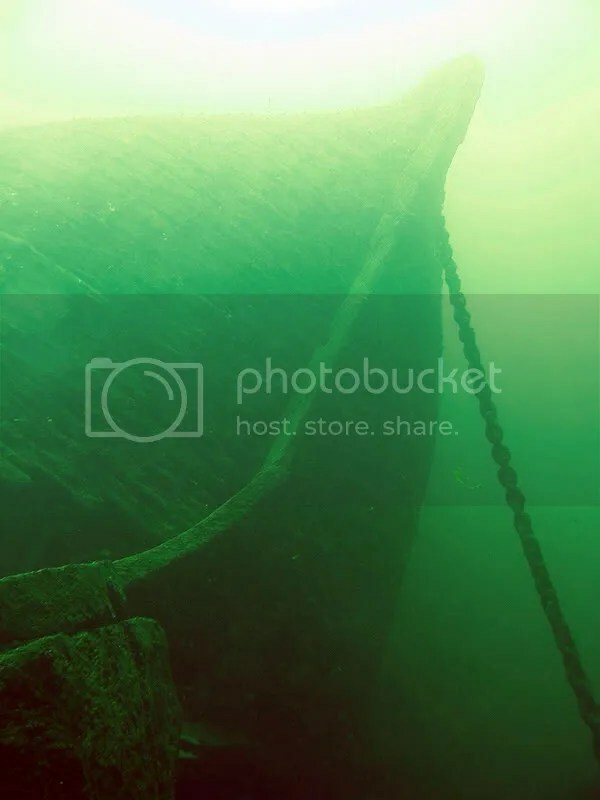 I could clearly see the entire stern section, all the way across the break to the midships section, and Jonathan poking around on the bottom 40 feet below me. Visibility was easily 70 feet and with so much to see I didn’t waste any time setting off. 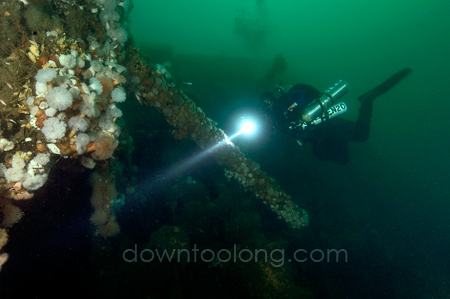 I was on the bottom just aft of the wreck when in the distance I saw Bedford arriving on the wreck and quickly caught up with him to get some pictures of him checking out the big deck gun mounted on the stern. We split up for a couple minutes as I rounded around the back to check out the prop which is half buried. Next I took off for the bow and took a slow swim taking in the sights along the way. 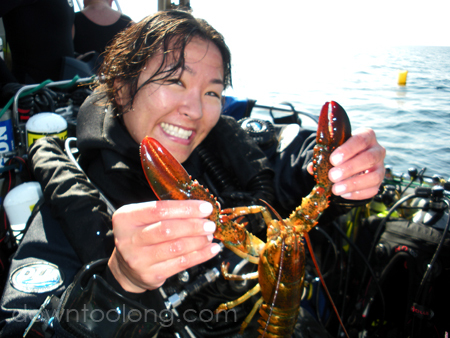 Lobsters were everywhere and I spotted a monster sized monkfish under the remains of the stern superstructure. 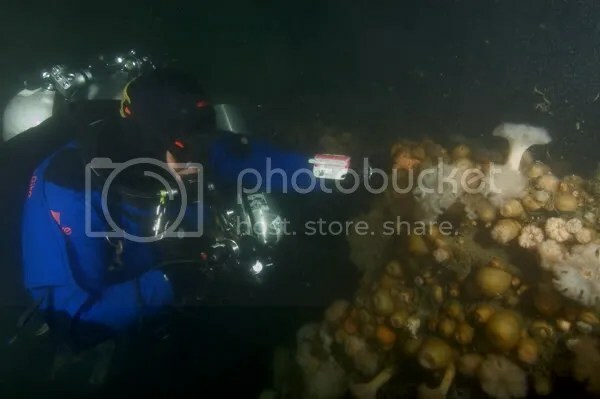 As I was returning from the bow and poking around in the debris field between the stern and midships and was staring at the exposed boilers and engine when I thought I was hearing high pitched screams. I saw Jonathan in the distance messing about on the bottom and thought he might be having an issue, but when I went to investigate he was putting a nice brass strobe from the wreck into his goodie bag along with a porcelain ashtray. Later found out he heard the “screams” too and thought it was me, but it turned out to be a pod of finback whales passing by that the guys on the surface saw near the boat. I wanted to stay on the bottom all day but the 4o something degree water was starting to get a little cool so I reluctantly headed up to the warm surface waters for a relaxing deco. Always a good time with the Sea Turtle guys and the COIMBRA was definitely worth the effort and I will be back! To top the day we spotted a huge (~20 foot) basking shark on the way in that Capt Chuck got in and snorkeled with (see post below). The beast wasn’t concerned and hung out for a few minutes and even let Chuck ride it before lumbering off with it’s curiosity apparently satisfied. From Shinnecock, it was straight to Pt. Pleasant, NJ for 2 days on the Independence II. Saturday RJ from Treasure Cove had the boat for morning and afternoon charters. In the morning we headed to the TOLTEN (95 fsw). Had a nice 20-25 feet of vis on the bottom. Some fish and lobsters came up along with several lobster pots that a fisherman on site had to cut loose when they got tangled in the wreck that we were able to recover. In the afternoon, RJ has a nice program to introduce new divers to NJ wreck diving where he takes them out for 1 dive on an intact wreck on the reef. Coupled with a sweet price (~$30) it’s a great way for people to check it out and it’s great to see shops promoting local diving. We headed to the JOAN LARIE III in 80 fsw on the Axel Carlson artificial reef. 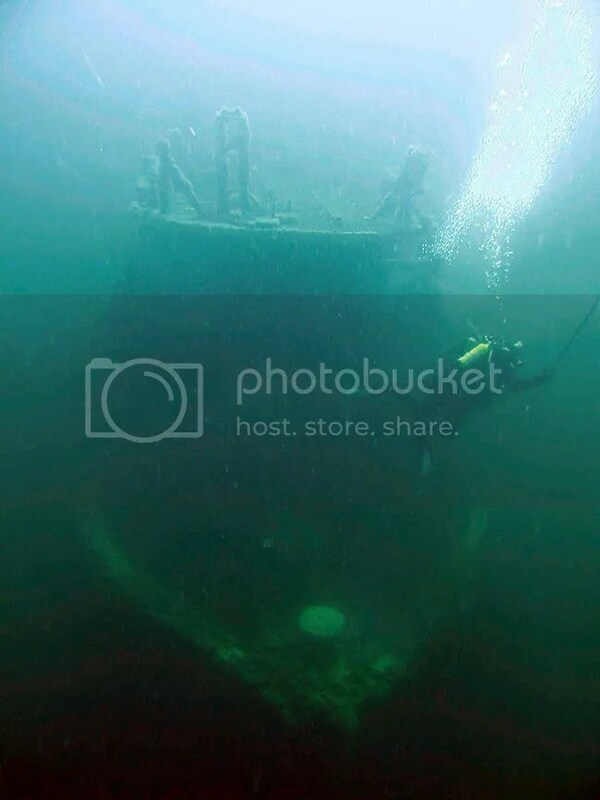 This intact tug boat comes up to 40-50 feet, is very picturesque, and makes a great dive for beginners. I splashed with Bill Trent to tie in with my camera in hand so I could hang out and get pics as people started coming down. Conditions were surprisingly good for only 3 miles out with about 25-30 feet of vis that got darker as the dive went on (we left the dock at 5:00 PM). Bill headed to the bottom and bagged some nice sized fluke, while I set up to take pictures. Lots of fish on the wreck, including several VERY large blackfish that seemed to be getting restless moving from spot to spot as the bubble blowers did laps around the wreck. All in all a very fun day. Sunday we had my favorite group on board, the Diversion Dive club, and we headed out to the ALGOL (140 fsw). Terry had us tied in on the top of the wreck at ~70 feet in less than 4 minutes! The 50 foot of visibility reported from Saturday must have moved on because we only had about 20 feet. 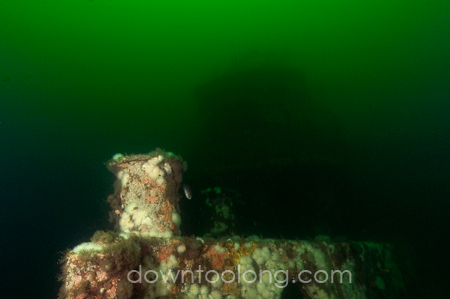 I was hoping to get some good wide angle longer exposure shots of this huge wreck using the tripod but with the vis less than optimal and lots of “snot” in the water I knew it wasn’t happening today and left it by the tie in. I had never seen all of the ALGOL so I decided to swim the whole wreck. We were about midships so I just dropped to main deck level (100 fsw) and picked a direction. 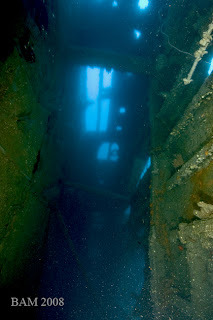 I soon got to the bow where a school of large cod startled me as they swam up out of the gloom from the bottom below. Several huge blackfish were spotted along the way and it’s good to see them in more numbers again. I had never been to the bow and I dropped into the chain locker/winch room in the forecastle. BIG electrical panels with monster sized breakers and big pulleys for the anchor chains flanked the room making for a pretty interesting little penetration. There were bare shelves along one wall which even though I knew I’d find nothing, curiosity took over and I still had to peak all the way to the back to make sure they were empty. Popping out I checked out the HUGE enclosed winch that hauled the massive anchor chains for this once mighty vessel. Finally it was time to move on as I knew exactly how long this next swim would be… 459 feet to the stern. I crossed paths with Diane near the tie in and snapped some shots before swimming on to the stern. With the proper outside tour complete I said goodbye knowing there is still SO much more to see on a ship this size. On my hang I started getting hit in the head with scallop shells so I knew someone bagged up. As Helen said, it was like snow in August watching the white “flakes” flitter by. In addition to the scallops, some bugs, some fluke, some tog, and some mussels all made their way to the cooler and I think it’s safe to say everyone had a great time.